ESR Starter Box Sets supply the basics that you and an opponent need to get started with ESR Napoleonics. Each of the Starter Boxes offers two Formations per player: one of infantry and one of cavalry, along with associated artillery. And just like every ESR Box Set, Starter Boxes come complete with Commanders, vehicles, bases, and flags. 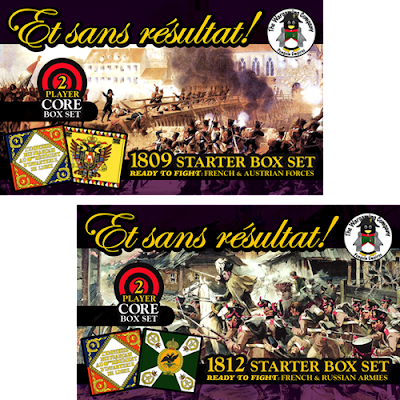 Our first two Starter Boxes feature the French vs the Austrians in 1809 and the French vs the Russians during the 1812 invasion. Pair these Starter Boxes with our ESR Campaign Guides for 1809: The First Battle Lost; or 1812: Master of the World and begin your journey to recreate entire historical campaigns! When you're ready, Starter Boxes can be expanded by adding Attachment Packs and bulk up your Force! Charge out of the gate with an ESR Core Box Set! Each one contains everything needed for a single player to prepare for their first battle. 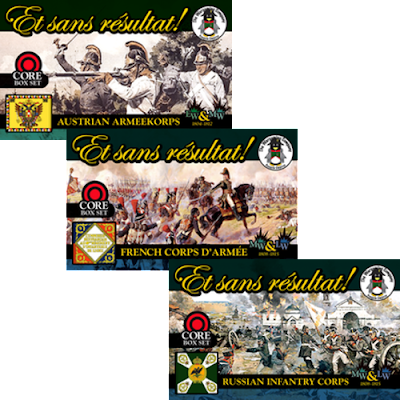 Every ESR Core Box Set contains an entire ESR Napoleonics Force organized according to its nationality's methods: The French Corps d'armée includes two divisions of infantry with artillery, and a light cavalry brigade; the Austrian ArmeeKorps has two infantry divisions with cavalry and artillery that can be attached to either Formation; and the Russian Infantry Corps has two large infantry divisions complete with light infantry and artillery. And just like every ESR Box Set, Starter Boxes come complete with Commanders, vehicles, bases, and flags. Once you decide you need more troops to get the job done, Core Boxes can be expanded by adding Attachment Packs to strengthen your Force. 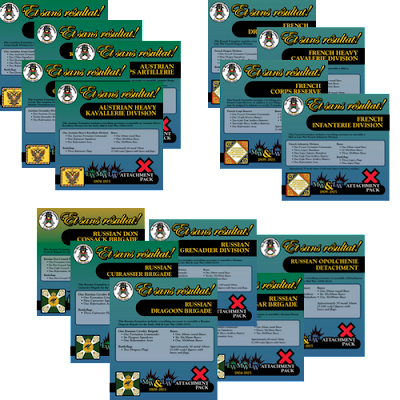 Attachment Packs are complete ESR Formations that can be added onto a Force. This let's players customize their Force for their next battle or even to organize it to match a historical campaign. Attachment Packs are the best way to add supporting Formations like heavy cavalry, or powerful reserve artillery. Attachment Packs can also provide additional infantry Formations if you simply need more rank and file soldiers for the next engagement.